Ask fellow campers about "Sugar River Forest Preserve" and nearby attractions. Beautiful campground in a pine forest. Lots of shade, river and hiking activities nearby. Friendly host. The mosquitoes were unbelievable, perhaps the worst I've ever seen, so if you have a screen house, bring it. There's a dump station and potable water. We camped at Sugar River Forest Preserve in a Motorhome. 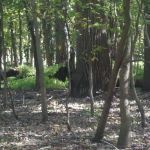 Are you affiliated with Sugar River Forest Preserve ?